WHAT WE ARE MADE OF……. The ability to replicate real hardwoods and stones using advanced photographic technologies is the foundation of luxury vinyl flooring systems. 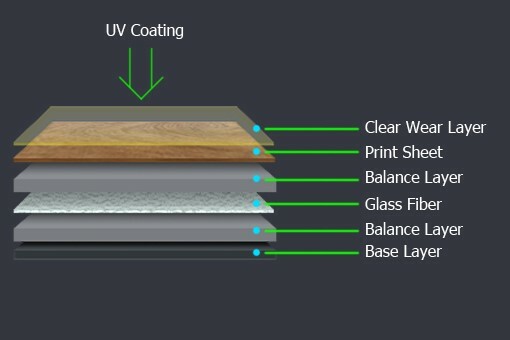 There are distinct layers fused together to produce the final product:, a polyurethane antimicrobial coating (PU) or aluminum oxide top layer (kills bacteria), a wear layer is a protective top layer (also called the mil layer) and is very important to the durability of the product, a printed color layer or photographic film layer, a cushioned fiberglass core middle layer, and a resilient non-skid backing (NS). 4 Corners – Luxury Vinyl Plank flooring offers our Bel Air featuring a 20 mil high density wear layer to meet everyone’s pricing needs without compromising quality. Our French Antique Series premium product with a 28 mil wear layer that is 40% thicker than our nearest competitor and a 9″ wide plank design. The Metro 3mm Plank flooring offers a unique ceramic bead top coat for superior durability and scratch resistance. Your floor will provide durability, strength and resilience for years to come. There has been a stunning transformation in the design aesthetics of Luxury vinyl flooring in the last five years. If you are linking it to “industrial” looking floors of the past, this is where you need to throw away your misconceptions and see a new world of design possibilities. With affordable pricing, functional design (it can be washed!) and with so many flexible applications, our flooring has drawn the attention of interior designers who are now taking note of our brand of luxury vinyl plank. The 3D-HD photographic layer adds a depth and realism to the total look of the plank, INCLUDING distressed wood finishes with tactile surface textures that make it hard to tell from the real thing! Because there are multi-layers of vinyl in Luxury Vinyl Plank flooring, as well as a resilient backing as the foundation, planks have more resilience underfoot. It’s easier to stand on for long periods of time AND as an added benefit, it tends to be warmer underfoot than ceramic tile. With very little preparation of your old floor, planks can be placed over existing ceramic tiles, old vinyl, even heated floors. In a condo? No worries, you can have the incredible look and feel of hardwood, with the knowledge that our floors that will meet or exceed strata regulations with an underlay. Using high resolution 3D-HD photography, the look and feel of nature’s best materials is captured in its look and feel in the plank flooring manufacturing process. 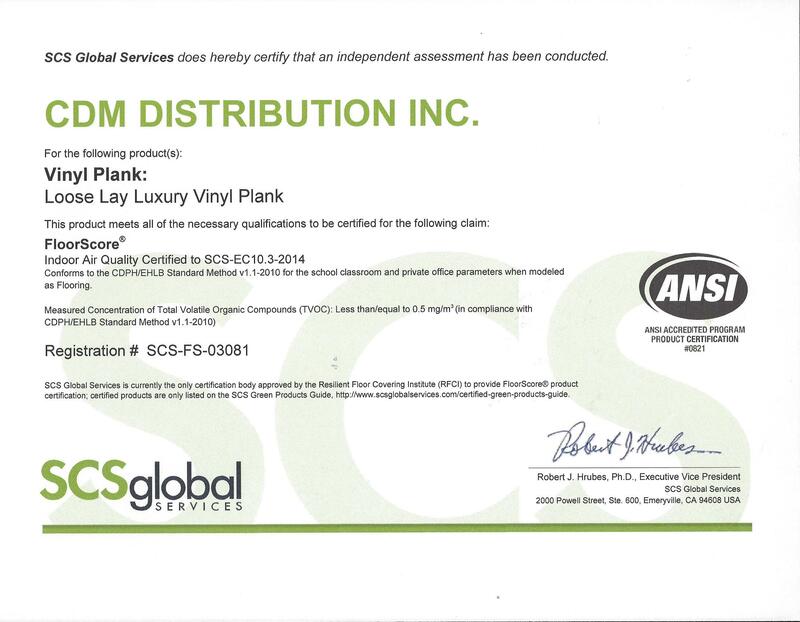 Luxury Vinyl Plank satisfies Green building standards and earns LEED points in commercial applications. Meets requirements of commercial flammability codes, slip resistant requirements and a menu of other safety codes. Quality vinyl flooring that is foam-backed with a fibreglass core provides a cushioned, flexible surface, making it an excellent choice for a sound suppression for condo strata approval. Using our top quality vinyl will help nullify and provide a nearly soundless surface that has spring and give for comfort. Simple damp mopping is all the recommended cleaning procedure needed for Luxury Vinyl Plank. Luxury Vinyl Plank available in standard size planks (7” x 48”). Luxury Vinyl Plank floors are inherently water resistant (and fairly impervious to wet spills from above). It’s important to install over flat, dry, approved substrates so that no water seepage occurs beneath the floor. Specialized wear layers offer the strength, durability and resilience to plank flooring. Polyurethane antimicrobial top coating system that is able to eliminate and destroy up to 99.9% of all bacteria, dirt on the surface of the floor. Since most luxury vinyl plank flooring is also constructed to withstand commercial wear and tear, its ideal for residential high-traffic areas as well as other areas of the home. Our Malibu Series offers a lifetime warranty for residential applications and a 15 year limited warranty for commercial applications. Because there are multi-layers of vinyl in Luxury Vinyl Plank flooring as well as a resilient backing as the foundation, planks have more resilience underfoot. It’s easier to stand on for long periods of time AND as an added benefit, it tends to be warmer underfoot than ceramic. Great thermal conductivity, best for underfloor radiant heating. There has been a stunning transformation in the design aesthetics of Luxury vinyl flooring in the last five years. If you are linking it to “industrial” looking floors, this is where you need to throw away your misconceptions. This may be the biggest factor that has caused interior designers to stand up and take note of the new brand of luxury vinyl plank. The 3D-HD add depth and realism to the total look, INCLUDING distressed wood finishes, stone and slate with tactile surface textures, and even woven textiles imbedded in the wear layers, are grabbing attention. Luxury Vinyl plank offers the option of a less permanent floor than wood or ceramic tile, especially with the growing popularity of floating or loose-lay floors. When a consumer selects a wood or ceramic floor, they should really be in love with it, as it will probably be in the home for a very long time. Whereas, Luxury Vinyl flooring offers the option of changing the room design much easier. BEL AIR/FRENCH ANTIQUE series Loose Lay Luxury Vinyl Plank should be placed on a completely dry surface. Please note that even though the floor may appear dry, please use a moisture testing device to ensure. PLEASE DISCUSS THE PREFERRED ADHESIVE FOR YOUR FLOOR WITH YOUR DEALER. In newly constructed buildings pre-dry floors for 7-14 days prior to application to ensure floor is completely dry. Sweep clean and dry mop surface to remove any debris. For heavy duty commercial applications or for installations with high moisture readings, please discuss with your dealer the preferred adhesive for your floor. Ensure that floor surface is flat and level. Use a scraper to flatten the floor surface or a putty knife to remove stuck debris (ie. Gum, labels). Maintain the room temperature and adhesive products to be used above 15°C for 24 hours before installation. Please allow time to acclimate your flooring in a warm room to ensure any residual moisture is allowed to dissipate. A slight haze may be noticed on the top of the floor, but this will dissipate within 24 of installation in a warm room. Find the exact centre of the floor by marking vertical and horizontal lines across the floor. Measure the squareness of the marked lines and then start applying adhesives on the first quarter of the marked floor space. Work on small portions of the floor at a time, and apply adhesives as per manufacturer instructions. Optimum usage of adhesive. Follow your adhesive product tack up times then lay the floor planks, staggering the planks for the best visual effect. Press firmly ensure that products is lying flat. Wipe up excess adhesive by using alcohol or alkali water. In order to allow the flooring adhesive time to cure, restrict traffic and do not move furniture onto a newly installed floor for at least 24 hours after installation. Wait at least 3 days before washing. Be careful not to put any dents or marks on the floor when moving heavy furniture and use felt pads on furniture legs to protect your floor. Furniture polish and/or rubber supports may leave stains on the floor surface over a long period of time. When removing stains and polish, do not use strong solvents or household cleaning fluids, instead use widely known alkali water based floor polish removers and cleaner. Sweep, vacuum and wet mop your floor regularly. The Loose Lay Luxury Vinyl Plank’s strong polyurethane coating and durable wear layer will protect your floor finish from everyday wear and tear. Do not expose your floor to frequent standing water and wipe up all spills quickly.